In this picture, you can see part of the pavement has been set aside for car parking on the A237 in Woodcote Road, Wallington. But there are at least two vehicles parked so badly that they spill out on to the carriageway and block the cycle lane. A cyclist cannot use the cycle lane, is forced out into the heavy traffic and then has to contend with those same parked vehicles being reversed out into the road. This is not a one-off. They always park like this. Why are parking rules not enforced? Why is taxpayers’ money used to fund facilities for cars, when their drivers do not obey the rules? ‹ What will the new London Cycling Design Standards mean for Sutton? My first thought when I saw the photo was, yes, it’s a clearly case of someone (or many people, if it happens all the time) parking in a totally inconsiderate way (which it is). Then I thought, well, perhaps the parking facility has been poorly designed (which it probably has been). As for the woeful, painted, incomplete, unattractive, next-to-useless cycle lane? Well, the less said about that the better. But actually, there are many more issues going on here. Although it cannot be ascertained from the photo how long this particular incursion lasted (probably not for very long, but as John makes the point, it is always happening), the photo tells a much more worrying story. The photo tells a story of how aspirations fail, even when the aim to deliver is initially set high. This photo tells the story of how the people who can make a difference, ultimately acquiesce to those who say “parking must be provided outside the shops of every High Street in the land” (even when, as in this case, there is a shed-load of, at times free and never very expensive, parking space provided very close by, and even when studies across Europe have shown that it is the quality of public space and people’s perceptions of attractiveness of an area that influence their decision on where to shop (for more on this see literature such as “The Pedestrian Pound: the business case for better streets and places” from Living Streets)). The Wallington Integrated Transport Package of 2009-2010 was all about putting in “infrastructure that makes walking, cycling and public transport the preferred way to travel and cuts congestion on our roads” (http://www.opinionsuite.com/sutton/highways-environment-and-planning/improving-travel-in-wallington). The consultation document (Improving Travel in Wallington: Copy of Exhibition Panels) for this transport improvement scheme, funded by Transport for London, but designed by consultants approved by Sutton Council, gave two objectives: “improve the look and feel of Wallington Town Centre in order to boost its attractiveness to residents, visitors and shoppers”, and “enhance pedestrian, cycle and bus access in and around the centre whilst improving traffic flow”. It was to “lock-in” the benefits of the 2007-2009 Smarter Travel Sutton behaviour change initiative (that had delivered increases in the number of trips residents make by bus, bicycle and on foot which, in turn, had helped everyone (if only by taking the pressure off parking). It was to do this “by ensuring that our roads and district centres encourage sustainable travel choices as much as possible”. As a sweetener “to minimise inconvenience to car users” the Library Car Park would be made free for the first 30 minutes, it would be resurfaced and tidied-up, and the pedestrian link between the car park and the shops would be improved. (To give this more context, it’s worth noting that many of the ideas that were outlined in the overall scheme to provide improved pedestrian and cycling links to Wallington Town centre were never delivered (and this remains the case today – although, of course, a line delineating a cycle lane has subsequently been painted on the tarmac). Now, five years on, we see the result of the “Wallington Integrated Transport Package” product. Clearly, it would be unfair and ridiculous to single out one photo, taken at one moment in time, as the decisive and conclusive evidence to suggest that the aspiration to fully realise the objectives of the scheme have failed. Many people would say that Wallington Town Centre is a better place now than it was in 2009, even if it have has not turned out as originally suggested. 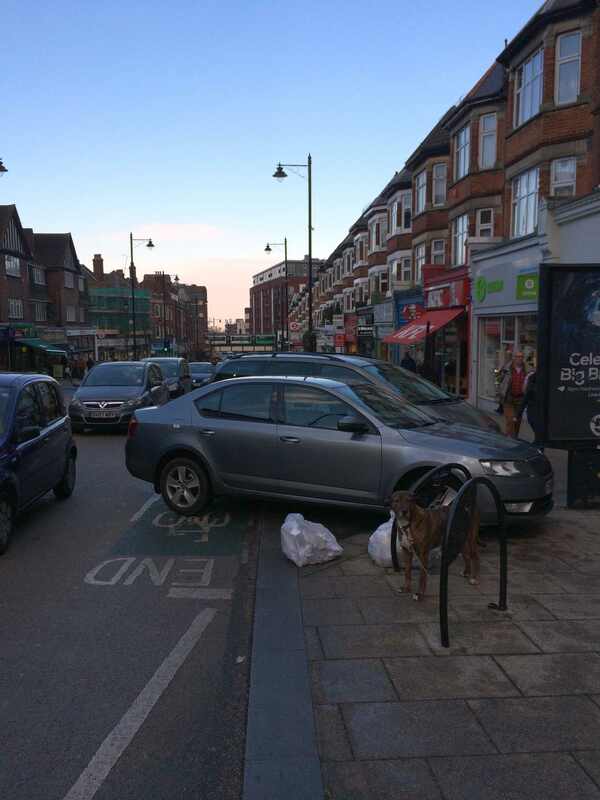 But, what does this photo tell you about the public realm, place-making, or about realisation of former aspirations to lock-in the benefits of Smarter Travel Sutton? In some ways it could be interpreted as saying more about why the parking space should not be there, than it does about inconsiderate parking. In which case the call could be for “no more tax-payer funded facilities until those responsible for delivery can prove they can get it right”. Most worryingly of all perhaps, this photo, gives a clear indication that, unless there are major changes in the way “difficult decisions” are managed by those responsible for delivery, the aspirations outlined in the draft Sustainable Transport Strategy (currently out to consultation until 4 January 2015) to see Sutton become London’s most sustainable suburb, will always only ever be aspirations. Unless the case is well made and understood, any proposals for a Sustainable Transport Strategy are certain to fail. Perhaps this photo, of inconsiderate parking, lack of parking enforcement, and poor monetary and public-realm value, tells an even bigger story. This particular bay is a goods vehicle loading bay and cars regularly park diagonally in it to get cash out of the ATM or to pop into the nearby KFC. Two local Councillors, Colin Hall and Jayne McCoy, have set up a Facebook group to try and get the bays changed to goods vehicles only. They ARE for goods vehicles only and all we need is for the regulations to be enforced. On the very rare occasion that I’ve seen a parking attendant in Wallington, they walked up to the motorist parked in the bay, spoke to them and let them go without issuing a ticket. Hardly a deterrent. Thanks for the comment and the names. I will be in touch with them. Sometimes the parking is so bad here that the pavement is obstructed as well… as I am sure you know. Interesting comments. parking in cycle lanes is pretty normal- look at foxlety lane in Purley where the cycle route in the Purley direction is always full of parked cars. One wonders what the point is of spending our money putting it down in the first place if it’s not going to be enforced? As to how suitable it and other cycle routes are that’s another question. i had to laugh when i saw in the Sutton so-called Sustainable transport strategy that GreenWrythe Lane is to designated as a (wait for it) ‘Quiet way’ for cyclists?!?! Have any LibDem councillors ever tried riding along it? It must be one of the most dangerous roads in the borough for cyclists! Yup, whoever parked that car has no consideration for other people whatsoever…however neither do the numerous cyclists that ride on the pavements (and, yes, it is still against the law). I jog on the borough’s pavements early in the morning and I have collided now on three occasions with cyclists coming round blind corners on the pavement. And these aren’t kids by the way, they’re mostly adults that should know better. In the winter they even do it without lights on…possibly using the perverse logic that ‘I have no lights, I might get knocked over or arrested, therefore its safer (for me) to ride on the pavement’. By the way, although not being hit by a cyclist every day, I am seeing it every day….and its quite a few different cyclists. Unfortunately reporting such incidents to the police is a non-starter. Apparently I have to wait until I’m seriously injured.